When winter strikes in Minnesota, we tuck away our summer clothes and lawn chairs and bring out the sweaters, coats, and scarves. But did you remember to get your home ready for the cold weather as well? 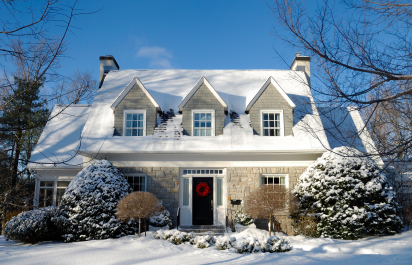 With the hustle and bustle of the holidays being over, now is the perfect time to winterize your home if you haven’t done so already. Check the Tree Branches- Knock snow from the tree branches in your yard to keep them from breaking under the weight. Insulate- Your attic requires 12 inches of insulation. When adding new insulation, make sure it does not have paper backing, which will cause moisture problems. Seal Leaks- Find the drafty areas in your home and seal them up with caulk or tacky rope on your home’s interior, and with weather-resistant caulk on its exterior. Recessed lighting, window and doorframes, and electrical outlets all tend to be drafty areas. Examine Your Furnace- Check your furnace to make sure it works properly. Change the filter, and continue to do so once a month throughout the winter months. When the filters are clean, it improves airflow and efficiency, and can help prevent fires. Install Storm Windows- Or, if they aren’t in your budget this winter, consider a window insulator kit. These kits consist of plastic sheeting that is applied to interior windows and may be removed in the spring. Inspect Your Chimney- Have a professional chimney sweep give your chimney a cleaning and check it for debris. Cleaning the chimney will prevent ash build up. Reverse Your Ceiling Fans- Setting your ceiling fans in the opposite direction will push the warm air down and help it circulate in your home. In order for your fan to push the warm air down, it should be rotating in a clockwise direction. Wrap Pipes- The freezing nights can result in burst pipes. Prevent them from bursting by insulating them with foam rubber sleeves or fiberglass insulation. And if you haven’t done so already, make sure you shut off the water to your outdoor hose as well. Check the Alarms- Since you are checking all of these other things in your home, you may as well make sure your smoke alarms are all working correctly! Replace the batteries if needed, and make sure you have a fire extinguisher in your home as well. If your home is usually filled with warm nights by the fire and baking, it is smart to have these things ready for any accidental fires that could occur. Take the time to check each of these tips off your to-do list, and you’ll be able to enjoy a warm, cozy and safe winter in your home!